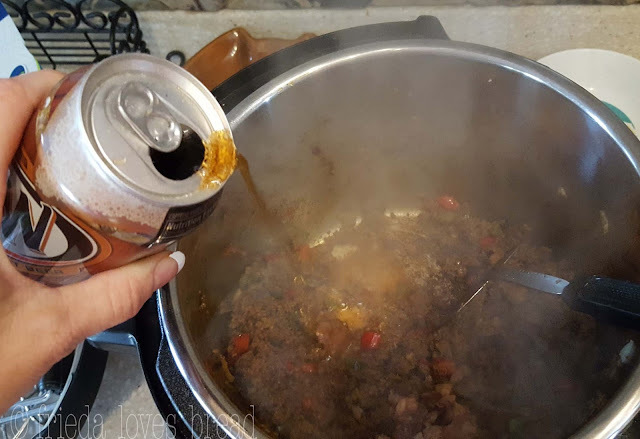 Football season is in full swing and this hearty Game Day Chili, which normally has beer, is family friendly, using our favorite Root Beer. Root beer lends a mildly sweet taste that compliments the spices that are commonly found in a traditional chili. This recipe also tones down some of the spiciness of the chili to appeal to kids of all ages. I found it to be in the 'medium' heat range, and you can play around with the amounts of spices and different types of chili peppers to suit your taste. This is a great basic chili recipe that you can adjust to meet your taste. 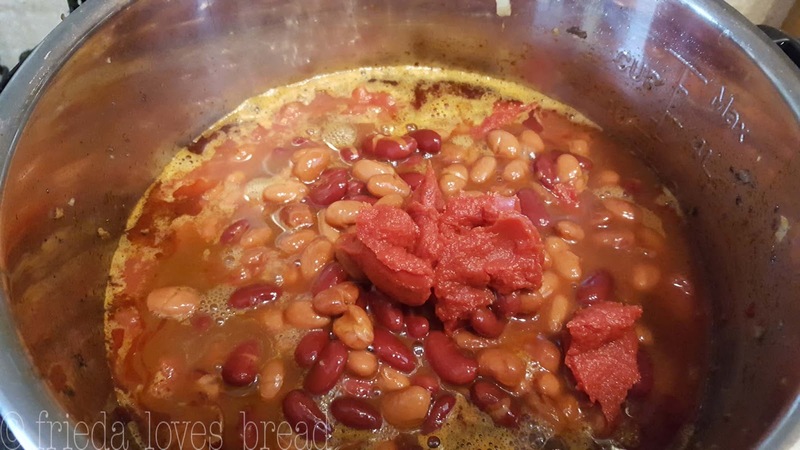 Even though the meat is browned, the beans and tomatoes are cooked, heating the chili allows ALL the flavors to blend, fuse, or 'marry' into the meat, beans, and tomatoes. When slow cooking or using a Dutch oven, the longer you simmer, the better the flavor will be. 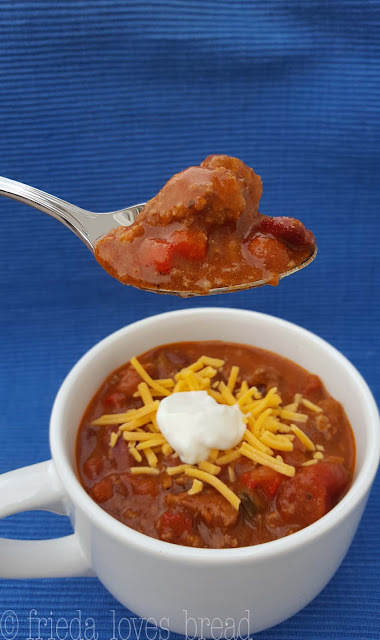 With pressure cooking, the pressure forces the flavors to quickly go through all the ingredients, giving your chili an all day flavor in a much, much shorter time. When pressure cooking, it is important to have enough liquid to be able to turn the liquid into steam, which helps create pressure. "Liquid" can be any thin, watery substance: water, broth, beer, wine or soda. Tomato juice, milk, butter, cream soups and sauces - anything with food solids, flour, or dairy cannot be counted as a liquid. If there is not enough liquid, pressure will not be achieved. You may get burned, scorched food on the bottom of your pot. If this happens, you will need to scrape the burned food off, add more liquid, and try cooking your chili again. Water, broth, beer, wine, carbonated drinks can be counted as liquid, as long as you have enough for your recipe and size of pressure cooker. 6 quart pressure cookers need at least 1 cup of liquid and 8 quart pressure cookers need 1.5-2 cups minimum. If you find after cooking that you have too much liquid in your recipe, you can use the saute or browning setting to help reduce it down to the consistency that you like, or make adjustments to your liquids in your recipe for next time. 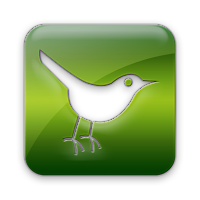 Many of the original recipes that I researched called for beer, Guiness, or a medium ale. I wanted this to be a family friendly dish, so I subbed it with Root Beer. You can use beer if you wish, but keep in mind that all of the alcohol doesn't cook out, especially if you use the pressure cooker method. 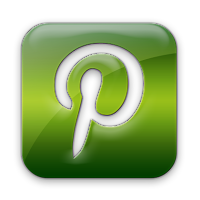 Tip: "Mise en place" (MEEZ ahn plahs), or French for "Putting in place." When you start, get all of your ingredients out, cut your veggies and measure your spices. 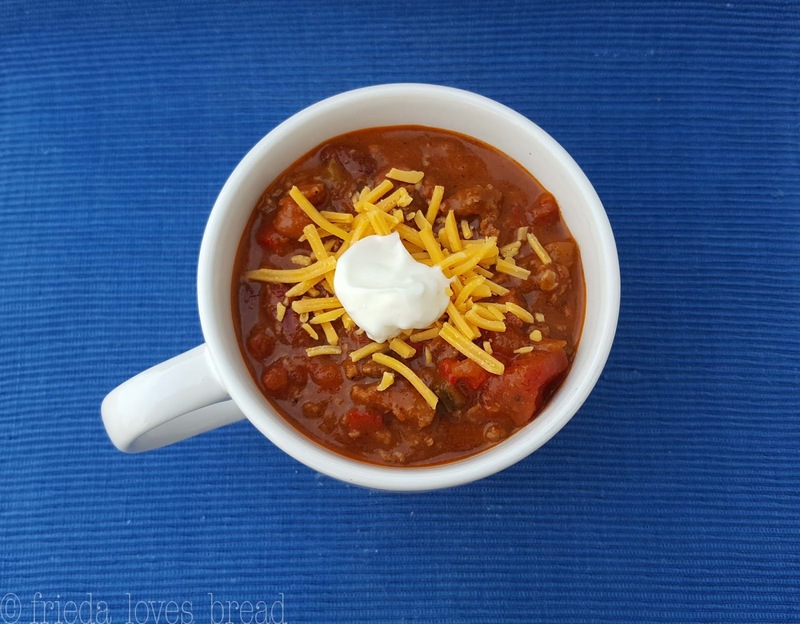 This will allow you to quickly put your chili together and not miss any ingredients. Chopping your onions and peppers ahead of time, measuring and freezing them in baggies are a great time saver! You can dump these into your chili with no thawing necessary. Measure tablespoon sized dollops of tomato paste on a plastic lined tray. Freeze completely, and transfer to a freezer baggie. Label and date. No more wasting cans of tomato paste. Tomato paste also comes in a squeeze tube, which is super easy to measure and use. 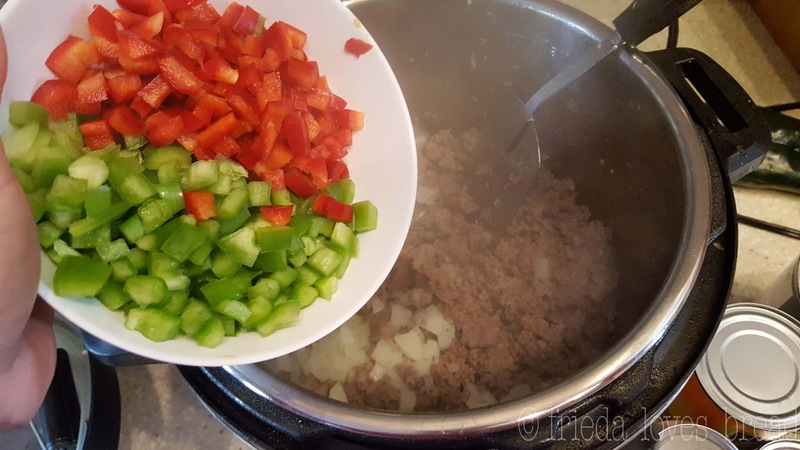 This chili starts with a basic mix of lean ground hamburger and sausage. 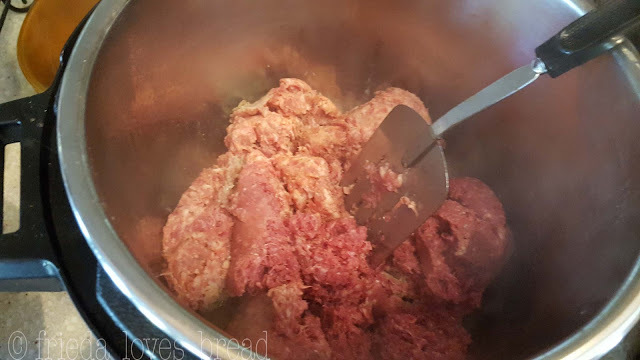 I use this combo when making my Marvelous Meatballs, as the sausage not only gives flavor to the ground beef, the fat from the sausage gives it a softer texture. The nice thing about using ground sausage is that you can choose your heat level. Jimmy Dean sausage comes in Regular, Hot, Sage, Chorizo, Country Mild and Italian flavors. I chose the Regular for this chili. My goal was to have the heat level in the middle range to please a variety of tastes. Put both your *lean ground beef (or turkey) and sausage into your pressure cooker, Dutch oven or deep skillet. Brown on the saute+more setting, or over medium-high heat. I love using this flat metal pancake spatula that I've had for years. It does a great job of chopping up the meat as you are cooking. 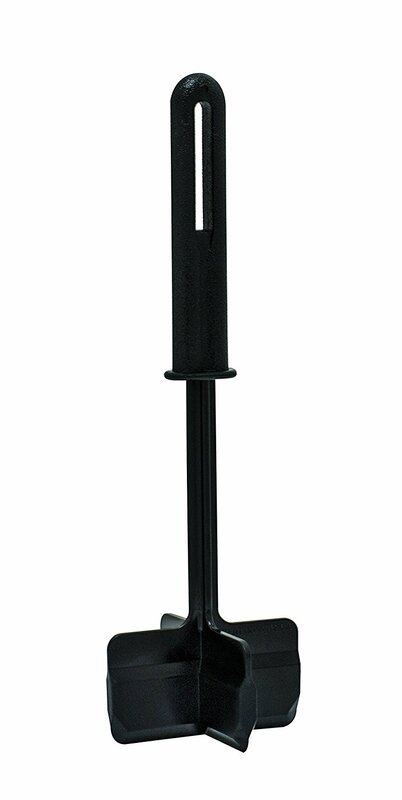 You can also use this tool which works wonders for chopping up meat in your pot, especially if your pot is enameled, ceramic, or non stick. 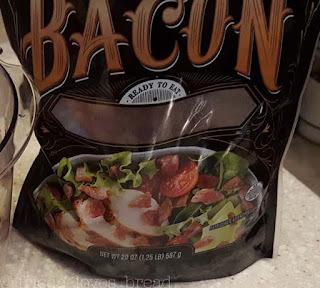 This recipe calls for bacon bits. You can cut up 6-8 pieces of raw bacon (with kitchen scissors) and brown it along with the sausage/ground beef, or you can use ready-to-use bacon. After browning your meat, add your chopped onions. Cook and stir till softened. Kids and I like our dishes mild - oldest son and hubby like spicy HOT. Fortunately, you can adjust the heat of this dish by choosing your peppers, sausage, and and by how much chili powder you use. How hot is a pepper? Generally, the shorter the pepper is, the hotter it is. Stir in your chopped red and green peppers, and garlic. Choose your peppers according to the heat level you want. Today, I'm using Red & Green peppers, and a Poblano or Anaheim pepper, which are mild. Toss in your seasonings. Stir and cook until you can smell all the wonderful aromas. Spices are often called, "aromatics" and when the hot oils hit the spice, it really brings out a more intense, deeper flavor. It is worth the extra 1-2 minutes that it takes to "bloom" the spices. At this point, you may see dark brown, stuck on bits of food on the bottom of the pan. 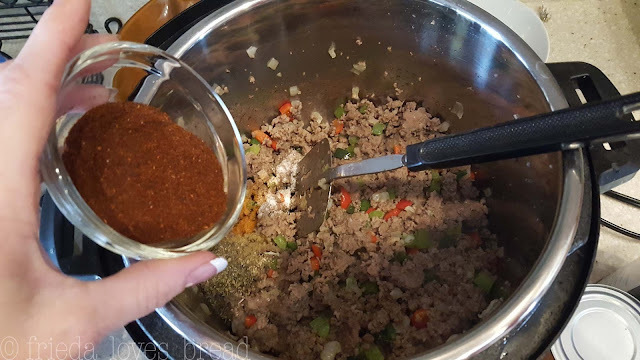 This is the "fond" or good stuff that enhances the flavor of your chili. You will need to scrape these cooked bits off to help your cooker get to pressure and to prevent further burning that can lead to a burnt taste. To help make it easier to remove the cooked on bits, move some of the cooked meat to the side. exposing the bottom of your pan and slooooooowly pour a little bit of your liquid (Root Beer) into the pot. It will sizzle and steam, so be careful. Once it stops steaming, pour the rest of your liquid in and give it a good stir, scraping off any remaining stuck on bits of food. This is called "deglazing" your pot. Pour in your diced tomatoes, and for pressure cooking, do not stir - we do not want any of the tomatoes to touch the bottom of the pot, as it can burn, scorch and prevent your pressure cooker from coming to pressure. Kidney beans are large and maroon in color. They are hearty and take well to spices, and are well suited for making chili. Pinto beans are pinkish and turn brown when cooked. They are a staple in most Mexican recipes. 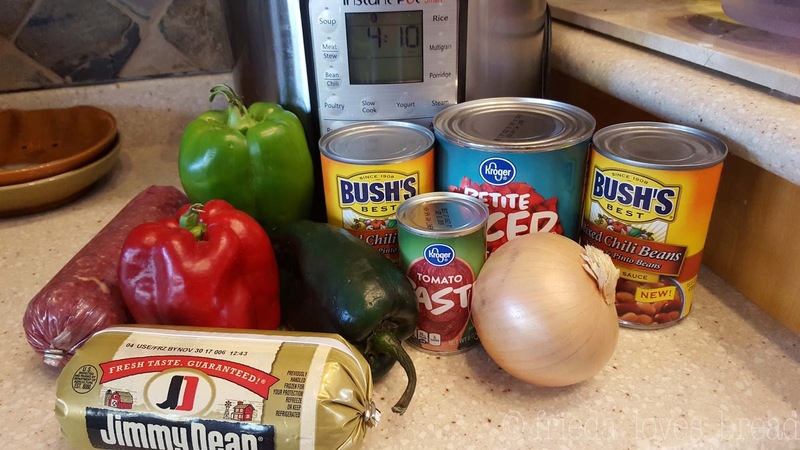 Great Northen Beans are a white bean, with a mild taste that are perfect for a White Chicken Chili recipe. I'm using canned chili beans for quick prep and short cooking time. 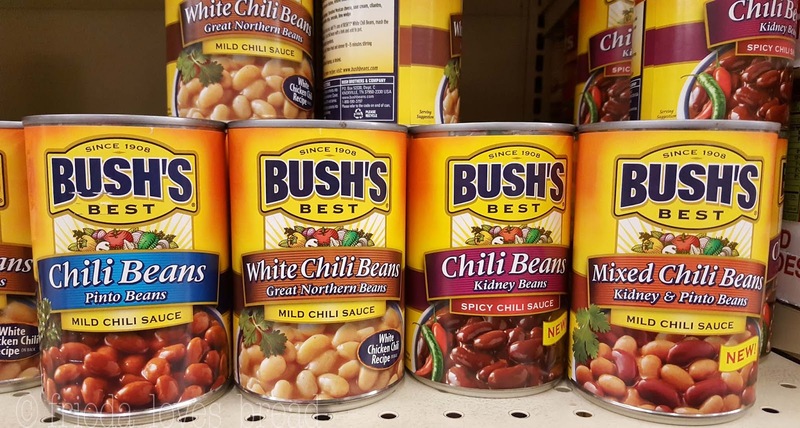 Bush's Best has a line of chili beans in sauce, which truly enrich and add flavor to the chili. I chose the Mixed Chili Beans in Mild Chili Sauce. If you can only find canned beans without the sauce, you will need to drain them for best flavor. Pour in your choice of canned chili beans, sauce and all. No stirring. Last, put your tomato paste on top. Tomato paste will give your chili a bright tomato taste. Lock the lid for pressure cooking, set for HIGH pressure, and time for 8 minutes. For stove top, simmer over low heat for 2 hours, stirring occasionally. Slow cooker, 4 hours on High or 8 hours on Low. Select Saute or browning. Chop the meat as it cooks, until it resembles bite sized pieces. 2. Add chopped onions and cook for 1-2 minutes, stirring occasionally. 3. Stir in minced garlic. 4. Add chopped peppers and cook for 1-2 minutes, stirring occasionally. 5. Add your spices: chili, oregano, cumin, basil, salt, pepper, cayenne, and paprika. Stir and cook till you can smell the aroma, about 1-2 minutes. 6. Deglaze your pot by moving the meat mixture to the side and slowly adding your root beer. Scrape off all the browned bits off the bottom of the pot. Do not stir from this point on. Dump the ingredients, but no stirring! 7. In this order: dump in your broth (or bouillon & water), diced tomatoes, cans of chili beans, hot pepper sauce (if using), Worcestershire, brown sugar and tomato paste. Sprinkle bacon bits on top. 8. 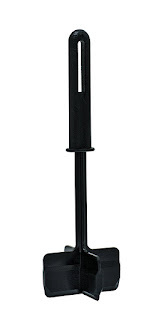 Cover, lock lid and close pressure valve (set to sealing). 9. Choose HIGH pressure and timer for 8 minutes. 10. When cooking time finishes, allow a 10 minute natural release. *This recipe should *not* be doubled for a 6 quart pressure cooker, but can be doubled for an 8 or 10 quart. Double the ingredients, but not the cook time. Filling your pressure cooker more than 2/3rd full can result in foam/liquid clogging your pressure valve and may prevent your cooker from coming to pressure. Follow steps 1-5, using a large, heavy bottom pot. Add Root Beer, beef bouillon (no water or beef broth), diced tomatoes, chili beans, pepper & Worcestershire sauces, brown sugar, tomato paste, and bacon bits, if using. Stir to blend well. Cover and simmer over low heat for 2 hours, stirring occasionally. The longer the chili simmers, the better it will taste. Remove from heat, stir, serve and enjoy. Follow steps 1-5, using a large skillet over medium-high heat on the stove. Add Root Beer to deglaze the pot and scrape off any cooked bits on the bottom of the skillet. Add beef bouillon (no water or beef broth), diced tomatoes, chili beans, pepper & Worcestershire sauces, brown sugar, tomato paste, and bacon bits, if using. Stir to blend well. Cover, and cook on LOW for 8 hours or HIGH for 4 hours.